After nearly three months of long lines, expired licenses, and frustrated workers and customers, the Idaho Transportation Department released another short-term fix to help alleviate long lines at the DMV. Starting Friday, ITD will begin mailing out renewal forms to all of those people who have a license expiring in the next two months. While those whose licenses have expired already can pick up forms at any DMV location in order to avoid hours of waiting in the lobby. 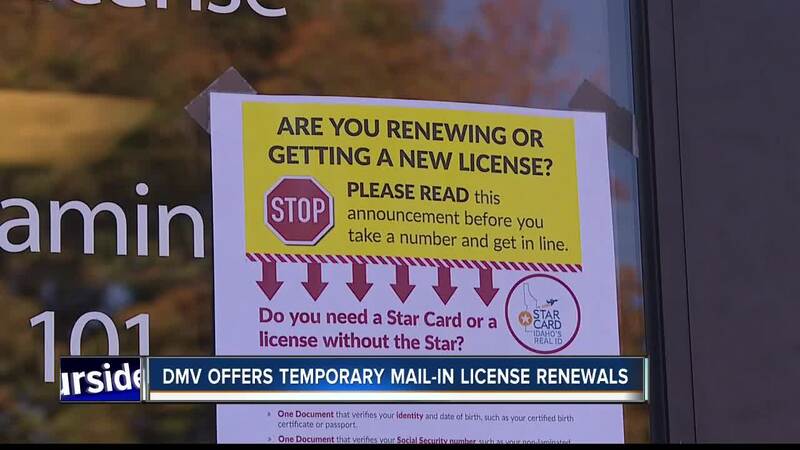 And while ITD hopes this temporary solution will help with lines now, if you plan on boarding a flight with your Idaho license after October of 2020, you'll be back at the DMV, as the mail-in option does not offer the “star card,” which is Idaho’s real ID. The mail-in program is one of several quick fixes to help county DMV offices catch up, after vendor technological issues forced statewide driver's license offices to close for nearly a week in August. And while the system is now considered stable, transaction times are still slower, adding to the already backlogged line. "When I came here, the maximum was one hour, but now, it's three hours, four hours," said customer, Fazi Mohammadi. And ITD assures those line times have nothing to do with the county sheriff's or their staff, but everything to do vendor software failures. "They have a right to be frustrated, this wasn't their fault, this wasn't the fault of their staff at the county offices, so we appreciate their willingness to work with us and develop these long-term solutions," said Trimboli. And for those customers who have a license expiring after the first of the year, as of now, a mail-in renewal option is not available, as ITD hopes to be all caught up starting January of 2019. • Only licenses that expire in November and December, 2018 are available for mail-in renewal. • The Star Card, Idaho’s Real ID, will NOT be available by mail. Citizens seeking the Star Card must present required documents in person at DMV offices to meet federal requirements. For a full list of items that are accepted to obtain the Star Card you can visit, itd.idaho.gov/starcard. • Commercial driver’s license holders cannot renew by mail. ITD, the Sheriffs’ Association and Governor C.L. “Butch” Otter’s office are working closely in partnership with each other on permanent, long-term solutions to DMV licensing issues. County assessor’s offices that issue vehicle registrations and titles are not experiencing long lines or delays.